Stung by the 2018 Kia Stinger! You are here: Home / New Car Reviews / Stung by the 2018 Kia Stinger! The Kia Stinger makes good on its performance credentials. 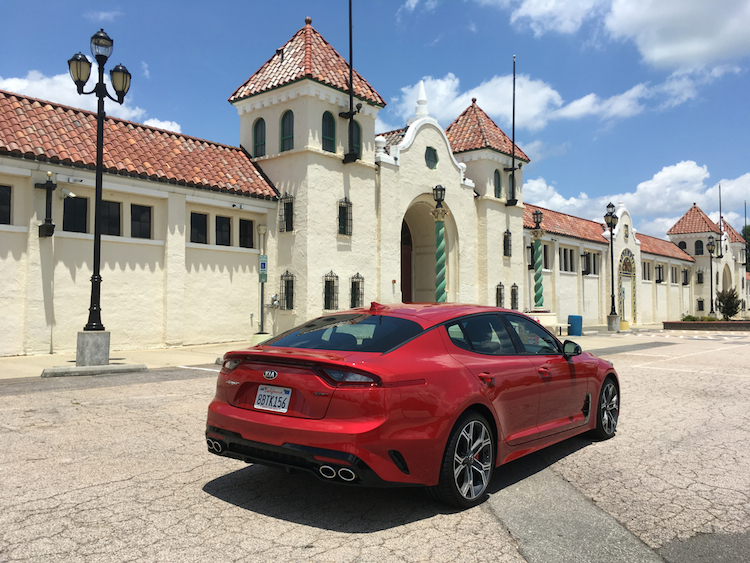 The Kia Stinger is a performance four-door with an affordable price. Is it a hot hatchback or perhaps it is a fastback sport sedan? 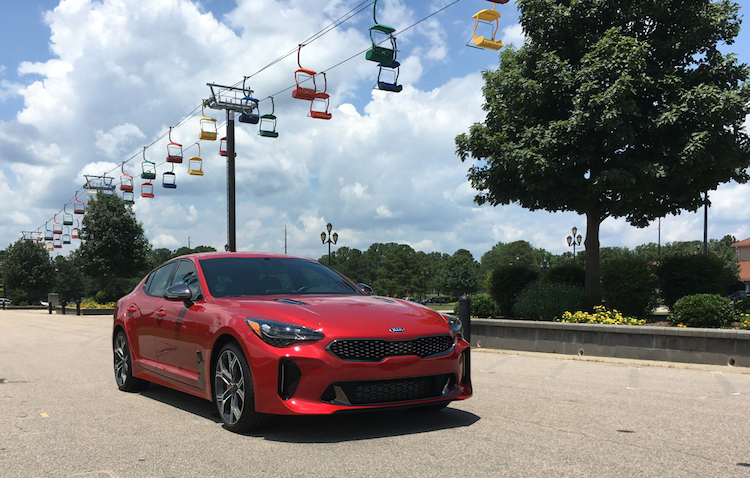 No matter how you define it, the all-new 2018 Kia Stinger is unlike anything we have ever seen from this wonderfully unpredictable Korean brand. Sure, the large Kia K900 luxury sedan utilizes rear-wheel-drive architecture, but with that model, you do not have the option of all-wheel drive as you do with the Stinger. Further, the 2018 Stinger takes aim at mainstream models such as the Dodge Charger and supplies an affordable alternative to the German’s top brands, namely Audi, BMW and Mercedes-Benz. 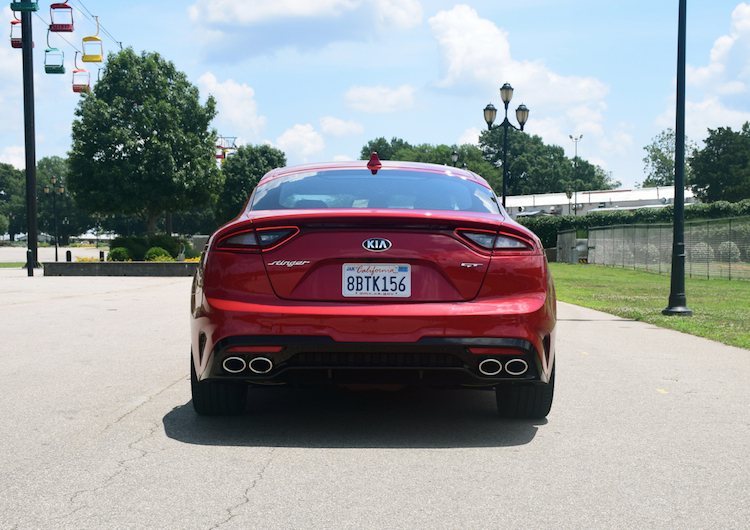 Kia’s Stinger approach comes by offering two turbocharged engine choices along with standard rear-wheel drive and optional all-wheel drive across the model line. This automaker considers the Stinger a grand touring car with exceptional handling. It was also tested on the famous Nürburgring track in Germany, the go-to location for current and aspiring sport models. Kia offers the 2018 Stinger in five grades: Stinger ($31,900), Premium ($34,100), GT ($38,350), GT1 ($43,250) and GT2 ($49,200). Add $900 for the destination charge and another $2,200 for all-wheel drive. The base powertrain has a 2.0-liter twin-scroll four-cylinder engine paired with an eight-speed automatic transmission. This model makes 255 horsepower and 260 pound-feet of torque. This particular combination is reserved for the Stinger and Premium grades. For the three GT grades, you will find a 3.3-liter V6 engine, generating 365 horsepower and 376 pound-feet of torque. Again, this model comes with an eight-speed automatic transmission. So, where is the manual transmission? You won’t find one. At least not at the moment. Kia took a small luxury car canvas to design this midsize premium hatchback. The look is sporty, aggressive and classy. Up front, Kia’s familiar tiger nose is evident. Bulging headlamps add visual appeal as does the splitter, the outside pockets and the hood with a pair of non-functional hood vents. The long hood, side vents and rocker panel sculpting enhance the look. Beautiful sport alloy wheels add exclamation points all around. The roofline flows back to the rear deck which is a hatchback, not trunk. There is a lot going on at the rear where the C-pillar meets the hatch. In particular, there is a lot of blank sheet metal present along with unusual wraparound reflector lights and vent pockets. 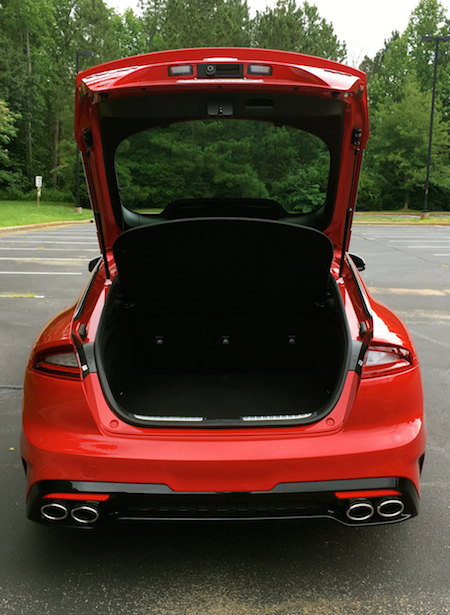 My test GT included a liftgate spoiler and a diffuser, which was punctuated by quad exhaust tips. Standard equipment includes bi-function projection headlights, automatic lights, LED front and rear lights, 18-inch alloy wheels, power-operated and heated side mirrors, and dual mufflers. Equipment upgrades include LED headlights, rain sensing wipers, 19-inch alloy wheels, a power tilt-and-slide sunroof, chrome accents and a rear diffuser. The Kia Stinger seats five as advertised. 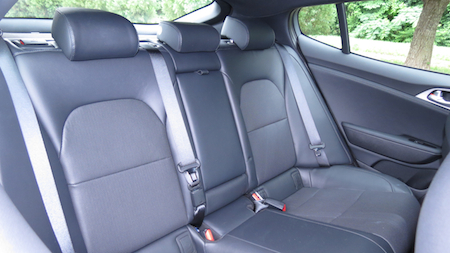 The front seats are comfortable, supportive and offer ample room. 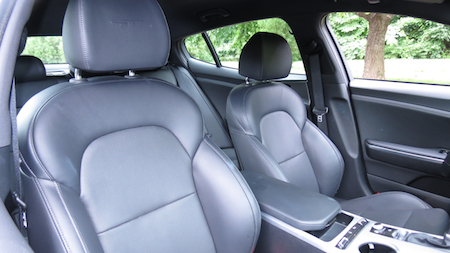 The rear seat can fit three across, although legroom may be tight for tall passengers. Also, because the roof slopes as it meets the hatch, headroom will probably become an issue for anyone over 6-feet tall. Given that the Stinger is a hatchback, you will find 23.3 cubic feet of standard storage space. That is about 50 percent more than the comparable sedan and is one important appeal of this model. Fold the rear seat and you have 40.9 cubic feet available. The Stinger’s cabin is upscale with soft-touch materials, leather and aluminum trim dominating. 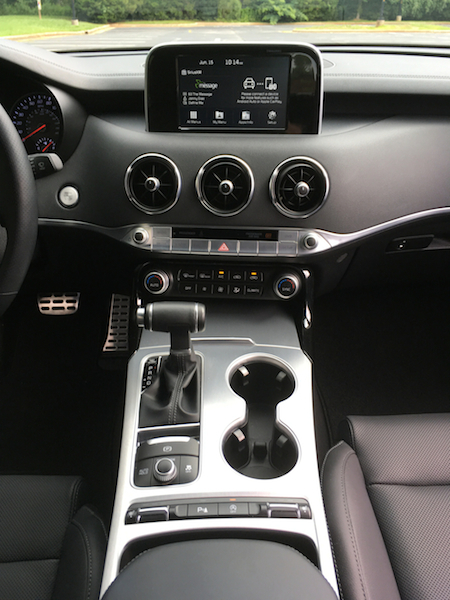 The instrument panel is fairly simple with large speedometer and tachometer dials flanking the digital driver’s information center. The center console is simple given that the color display sits on top, followed by a trio of circular vents grouped underneath. Knobs and buttons control the audio system, which sits directly above an enclosed storage area. The transmission stick, two cup holders and drive mode controls are located just forward of the center armrest/storage department. The interior does not rise to the level of the Europeans, but it is definitely a cut above most other Kia models outside of the K900. A quiet interior, comfortable seats and superior fit and finish work to the Stinger’s credit. The only feature I missed was the driver’s seat extender, available only on the GT2. Standard features include door scuff plates, a manual tilt-and-telescopic steering column, a heated steering wheel, leather seats, a power driver’s seat with lumbar support, a power front passenger seat, and dual-zone climate control. Upgrades include heated and ventilated front seats, aluminum pedals, premium leather, and sport instrument gauges. Among driver-assist safety items, you will find a rearview camera with dynamic guideline, along with front and rear parking distance warning. Available features include lane keep assist, front collision warning, forward collision avoidance assistance with pedestrian warning, lane departure warning and lane keep assist, blind spot collision warning with rear cross-traffic collision warning, smart cruise control and a head-up display. What is great here is that nearly every feature is available on all trims. The lone exception is the head-up display, which is reserved exclusively for the GT2. As for tech items, the Kia Stinger comes well equipped too. The standard equipment list includes a seven-inch color touchscreen display, six speakers, satellite and HD Radio, and Kia’s UVO telematics system. You will also find Bluetooth wireless technology, Android Auto and Apple CarPlay smartphone compatibility, and USB ports. Optional features include nine- and 15-speaker audio systems, and an eight-inch display with navigation. I can only comment on the V6 engine as I have yet to be supplied access to the base engine. That said, performance-oriented drivers will naturally gravitate to the larger engine, which supplies V8-like power. Kia’s 3.3-liter V6 has been in use for a number of years in various Hyundai, Genesis and Kia products. 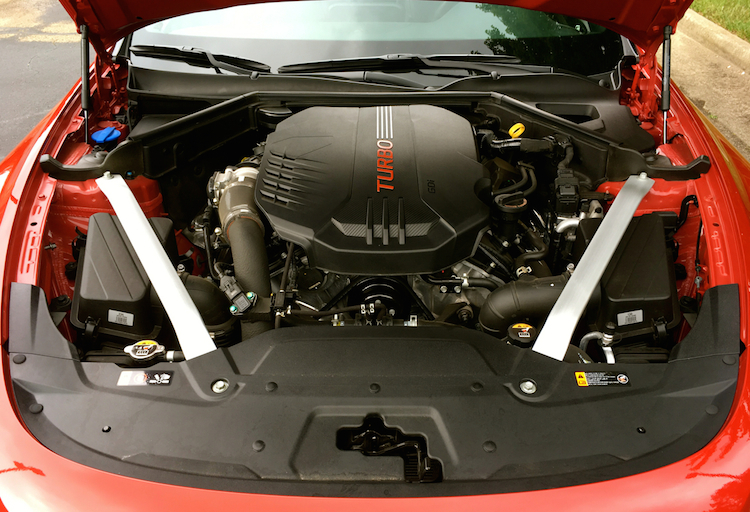 For this model, twin turbos were added, giving this sedan the boost it needs. That said, it is not the most powerful engine in its class. You will find Infiniti, Lincoln and Cadillac among the luxury brands with 3.0-liter turbo V6 engines delivering an output of 400 horsepower. As for the model at hand, the Kia Stinger offers strong step-off acceleration and quick spooling turbos to ensure maximum performance when you need it. You have your choice of drive modes to work with. Comfort is the default mode, with Eco, Sport and Custom the others. Place this sedan in Custom mode and the transmission shift points stretch out, the engine growls, the steering becomes extra weighty, the dampers adjust and the exhaust system deepens. You will find MacPherson struts up front and a five-link independent rear suspension. All rear-wheel drive models also come with a rear limited-slip differential. As for the all-wheel-drive models, a torque vectoring system sends power to the outside wheels in a turn. 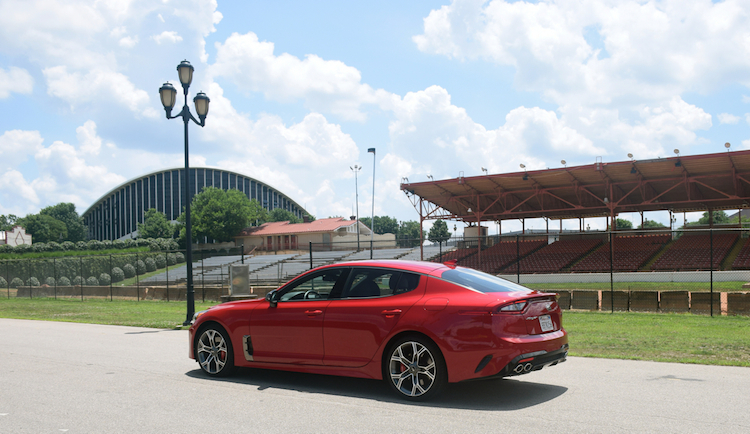 The Kia Stinger offers a firm, yet comfortable ride. Further, steering is sufficiently weighted and this sedan performs admirably when pulling out of corners. Braking is firm — just what you want for maintaining control. Stomp on the accelerator and the Stinger moves forward quickly. The transmission cooperates, moving through the cogs with ease. Absent a stick, the paddle shifters have to do. The steering is communicative and the Stinger toes the line on the twisties without drama. Clearly, this is the most fun-to-drive Kia yours truly has ever driven — in GT guise it shines brightly. Kia has thrown down the gauntlet and now we will observe customer sentiment. The first few Stinger models went on sale late last November. Since then, demand has steadily picked up most months. We do not know what the sales sweet spot is for this model, but 20,000 units per year in the US market alone seems within reach. That number serves as a ringing endorsement of the Kia brand, which has six lines of sedans at the moment — Rio, Forte, Optima, Stinger, Cadenza and K900. Yes, the market reflects a shift to crossovers, but Kia is doubling down on sedans while it adds new utility vehicles. While the German market is certainly in play, in the Stinger, Kia also targets Dodge Charger, Chrysler 300 and Chevrolet SS owners. My test Stinger GT RWD model costs about $40,000, which seems to be the right price for anyone wanting a sizable performance sedan. Kia Stinger photos copyright Auto Trends Magazine. All rights reserved.